And thus, Adventures Across Oregon was born. 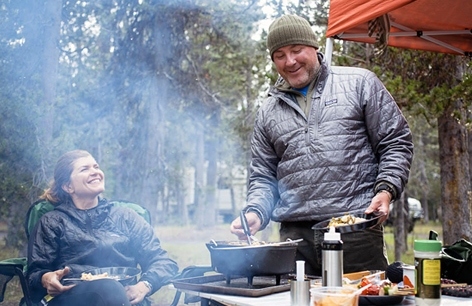 Ethan and Wendy (who calls herself a “recovering” legal assistant, having worked for 12 years at a Portland law firm) formed their adventure travel company to introduce people to the natural wonders of Oregon, primarily through fly-fishing. The first step for the 40-something Barrows was to downsize. They sold their house in town, traded in the Audi for more practical wheels and cut back in other ways until they’d reduced their monthly footprint by two-thirds. 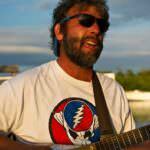 They took much of their savings to help fund the company — a van and a Subaru wrapped with vibrant murals depicting trees, mountains and a river, as well as a large garage stocked with fly rods, waders, life jackets, pontoon boats and a host of other outdoor gear. “The idea is guests step off the plane with a bag of clothes, and we get them everything else they need to have their adventure,” Ethan says. 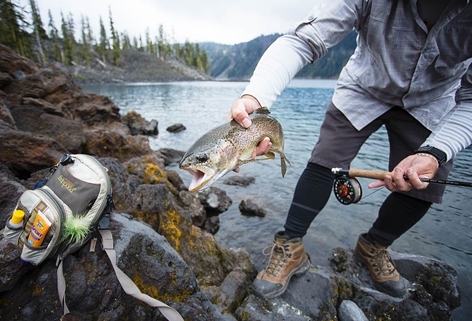 In a state renowned worldwide as a fly-fishing destination — and where hundreds of guides already ply their trade — Adventures Across Oregon has taken a slightly different approach. 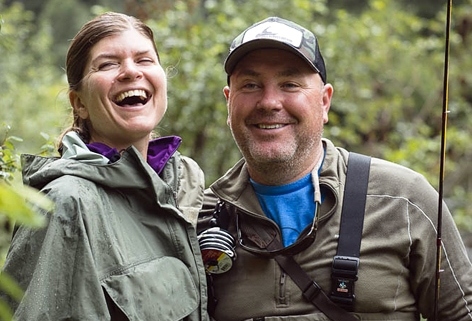 Ethan and Wendy have identified their market niche as “the fly-fishing curious.” These are people who want to try the sport but are not so committed (at least not yet) that they want to schedule a three-day, hard-core, dawn-to-dusk, fly-fishing-only excursion. An average day might include an informal “intro to fly-fishing” course covering basic equipment, fishing knots and insect life on the river or lakes that will be fished. A few hours of trout fishing might be followed by a mountain bike ride, a hike or a stop at one of the state’s many wineries or breweries for a tasting. The Barrows customize every trip to their clients’ interests. 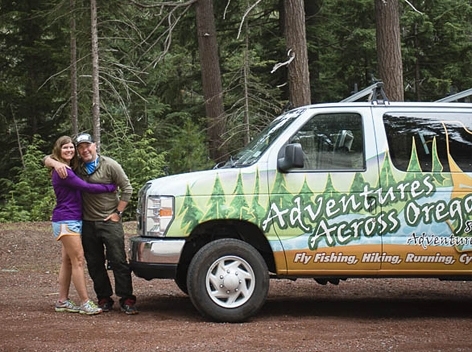 Take to the back roads almost anywhere in Oregon during the spring-to-fall fishing season and there’s a chance you’ll come upon the Barrows’ brightly decorated van. 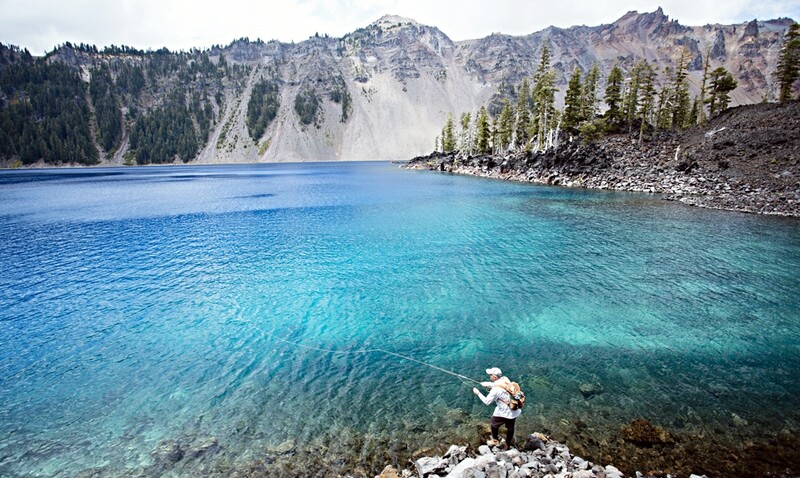 Regular stops include Anthony Lakes near Baker City in Eastern Oregon, a series of private lakes near the Central Oregon town of Maupin, and a variety of rivers and lakes in the Tillamook State Forest, astride the Coastal Range west of Portland. 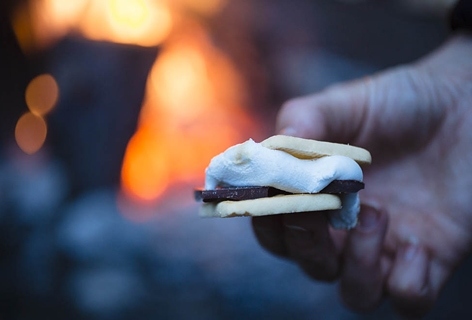 While Ethan guides, Wendy sets up a canopied day camp where clients can retreat for a freshly prepared lunch and a little relaxation before returning to the water … or moving along to the next activity. There have been some adjustments for the Barrows as they’ve pursued their dream: fewer dinners at Portland’s trendy restaurants, no certainty of when the next booking (and paycheck) will be coming in, and no clocking out; in the hospitality business, you’re always on. But customers keep coming back. As of this writing, nearly all of their 2015 visitors have been repeat customers.